As expected, George Zimmerman's acquittal Saturday is seeing it's fair share of fallout. So far, there have been demonstrations and marches across the United States, and even cancelled book deals. 1. Black preachers are planning protests in over 100 American cities this weekend. On Tuesday, Reverend Al Sharpton and about 15 other clergy announced that they're planning demonstrations across the U.S. this weekend, in order to press for new charges against Zimmerman. They're also hoping to repeal the "stand your ground" self-defense law that helped get Zimmerman acquitted. 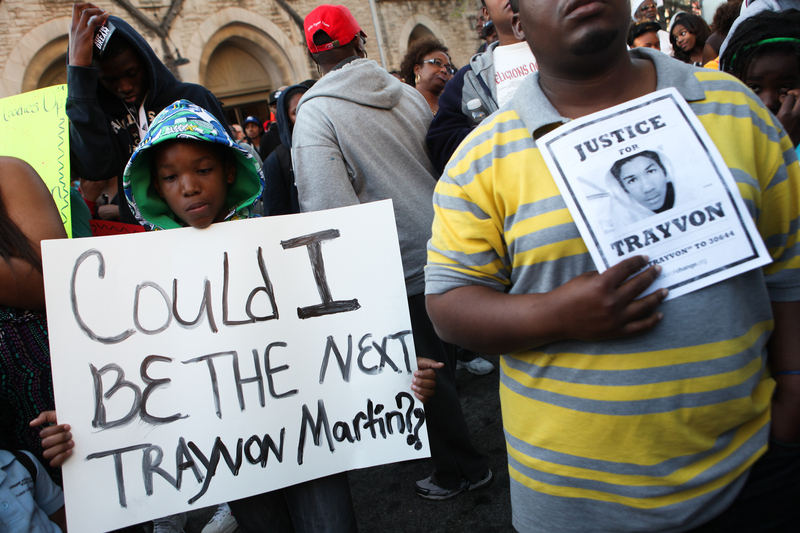 They say Trayvon's death is a signal that the civil rights movement needs to be reenergized. "There is going to be an intellectual riot," said one of the pastors. "One hundred cities are going to feel the wrath of a guided, intellectual, meaningful, spiritual uprising." 2. Rachel Jeantel has been offered a full-ride scholarship to the college of her choice. If you didn't see Rachel Jeantel's interview with Piers Morgan last night, you should. Jeantel, who was the prosecution's main witness, talked about her close friendship with Trayon Martin, and the difficulty of her loss. It's pretty gut-wrenching, so prepare to cry. As it turns out, radio host Tom Joyner called Rachel up right after the interview to tell her he how much he admired her—after which he said that he'd pay for her to go to any Historically Black College or University. "I will help you get tutors to get you out of high school, tutors to help you pass the SAT and I will give you a full ride scholarship to any HBCU you’d like," Joyner told her. 3. Sybrina Fulton, Trayvon's mother, broke her silence on Twitter. Fulton and Martin's father, Tracy Martin, are also pushing for limits on the "stand your ground" laws. 4. Beyonce took time to pay tribute to Trayvon during a concert. Her concert began about a half hour after the Zimmerman verdict came out on Saturday. 5. And finally, the "We Are Not Trayvon Martin" Tumblr is going viral. The new Tumblr was created in response to the verdict, and plays on the "We are Trayvon Martin" slogan, which is popular with protestors who support Martin. The Tumblr seeks to opens up conversations about civil rights, racial profiling, and white privilege. Check it out here.